The pastores (herders) have always been part of the bull run. 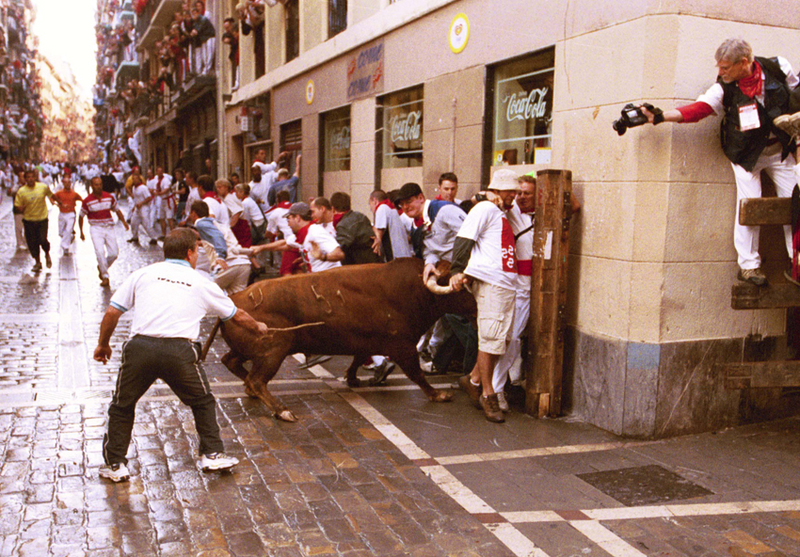 Way back in the Middle Ages, when the concept of running with the bulls had not yet developed, the herders were responsible for bringing the cattle on foot through the fields to Pamplona and then through the streets. Today there are eight to ten herders in the morning bull run. All dressed the same, so that they can be easily identified, and carrying a stick, each herder is assigned a section of the run of approximately 100 meters, after which his work is passed on to the next in line. The herder's job is to run behind the bulls to ensure that the herd does not break up, to prevent the bulls from running back up the route and to keep runners away from stray bulls. The herders are experts in handling cattle and in the difficult art of cutting short a charging fighting bull however, curiously enough, for the rest of the year most of them do not work in the cattle sector but have professions as far removed from the bullfighting world as civil servants, fishermen or farmers. In addition to their work in the bull run, the San Fermin herders are also responsible for all bull-related aspects of the fiestas: the Encierillo or short, evening bull run; the Vaquillas Emboladas - cows with padded horns which are let loose in the bullring once the bulls are in their pens; the morning bull festival and the Fiesta Campera- amateur bullfights in which the bull is not killed; the separation of the bulls into individual stalls at the bullring and the Sobreros or substitute bulls during the bullfight. The figure of the Doblador or guider was created in the thirties for the protection of the runners once the bulls enter the bullring at the end of the run. There are currently four Dobladores working in the Pamplona bullring, all ex-bullfighters, former Novilleros - apprentice bullfighters fighting 3-year old bulls, or assistant bullfighters, who combine their professional jobs in the bullfighting world with their considerable experience in the Pamplona bull running. Their role is to get any bulls remaining in the ring into the pens as soon as possible, and to protect the many runners in the ring from the bulls. Each Doblador carries a cape to attract the bulls and take them to the pens; however the cape is not used to make passes, but is dragged along the sand, in this way they can ensure that the afternoon bullfighters cannot claim that their bull has already been fought.